Big Joe Turner was one of the most prominent, distinctive and successful of the “blues shouters” who were very much a key part of the blues and R&B scene during the 1940s and ‘50s, helping to lay the groundwork for the music which developed into rock ‘n’ roll, revolutionising the pop landscape during the 1950s. Turner had been active right through the 1940s working with pianist Pete Johnson’s band and others, and had R&B hits with songs like “S.K. 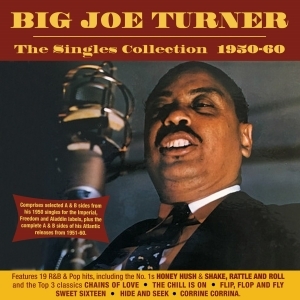 Blues” and “My Gal’s A Jockey” See Big Joe Turner “The Essential ‘40s Collection” ADDCD3069). However, it was after signing to Ahmet Ertegun’s Atlantic label in 1951 that his work became more commercial and he racked up a string of R&B and pop hits through to 1960, which had a huge influence on the artists at the forefront of the rock ‘n roll explosion. This great value 55-track 2-CD set comprises selected A & B sides from his singles during 1950 for the Imperial, Freedom and Aladdin labels, which include the Top 10 hit “Still In The Dark”, plus the complete A & B sides of his Atlantic releases from 1951-60. It features 19 R&B & Pop hits, including the No. 1s “Honey Hush” and the original version of “Shake, Rattle And Roll”, covered by Bill Haley to have a significant pop hit, and the Top 3 classics “Chains Of Love, “The Chill Is On”, “Sweet Sixteen”, “Flip, Flop And Fly”, “Hide And Seek” and “Corrine Corrina”, the last-named a pop chart entry as well. It’s a comprehensive overview of his recordings during the most successful era of his career, and it showcases his unique vocal style and masterly feel for the blues and R&B idioms which provided a template for the likes of Bill Haley and Elvis Presley to interpret to make such a huge impact on popular music.